Back when the Cubs won their division in 1989, my brother and I were in 8th grade. Domingo Ramos was to become a personal favorite of ours because of the way he wore his baseball hat. He would bend the bill to an extreme curve and wear it very low on his head almost covering his eyes. When we would play baseball, we would wear our hats in the cool Domingo Ramos style. Thus a he developed a cult-like following amoungst our friends. GO GO dominGO! Recently I have procured a Domingo Ramos bat off ebay! It even has duct tape marks. What a guy! He uses duct tape on his bats! Check it out in real-life size! Now you can have your very own Domingo Ramos poster! Download yours for free today!  What is Domingo doing now? Can't get enough of Domingo Ramos? 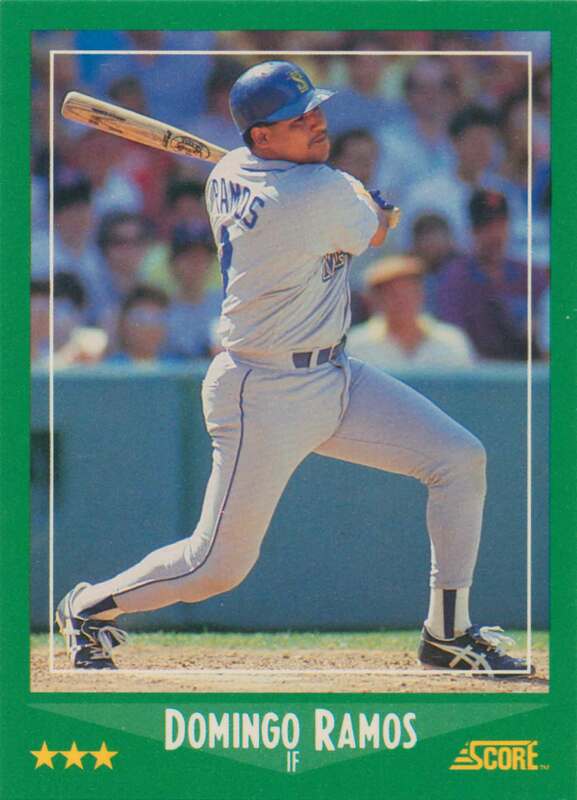 Yeah, yeah, all I have is one lousy baseball card of Domingo when he was with the Mariners. I've gotta find some cards of him with the Cubs. Please send any Domingo Ramos cards to me! Email me for my postal address. I kinda like how this baseball card puts "IF" for infield. But it could also be read as "if". Like... What "if" Domingo Ramos hit the ball here.